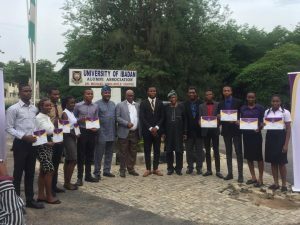 Thursday ,11th April, 2019, proved to be a date to remember for ten (10) indigent undergraduates of the University of Ibadan, as the oldest surviving students’ organization in West Africa, Sigma Club, University of Ibadan, held its scholarship awards ceremony. The event which held at the University of Ibadan Alumni Centre Hall featured the presence of the Chairman of the occasion, Prof. Gabriel Ogunmola (Chancellor, Lead City University); the Chairman, Sigma Scholarship Scheme Board of Trustees, Chief Dr. Okon Onyung (President, Ship Owners Association of Nigeria); Dr. Demola Lewis (Deputy Dean of Students, University of Ibadan); Dr. Femi Oyamakin (Representative of the Old Sigmites’ Association); the ten (10) beneficiaries; Loyal Sigmites (male undergraduate members of the club) and other invited guests. The event began with the recital of the Sigma Anthem and was anchored by Loyalist Ajah Chinedu. The Sigma Chief, Valentine Igbonekwu, in his opening address related that the scholarship scheme is an initiative of the socio-philanthropic club aimed at helping to solve the existential problems affecting the educational sector by rewarding and awarding diligent but indigent students by providing full and relief scholarships to enable them complete their education and actualise their academic goals. He further revealed that the scholarship is worth one hundred thousand (100,000) naira annually per beneficiary, and shall cover tuition and accommodation as catered for directly by the club. The Chairman of the occasion, Professor Gabriel Ogunmola, reiterated the philanthropic cause the club was poised to achieve especially as it relates to how it betters the society’s lot. He further charged the beneficiaries to remain outstanding in their academics, morally upright, agents of change and seize every opportunity to give back to the society. The Chairman of the Sigma Scholarship Scheme, Dr. Okon Onyung, also congratulated the beneficiaries and promised more commitment to the scheme, while recounting the unforgettable memories he had being a Loyal Sigmite as an undergraduate. Dr. Demola Lewis, who stood in for the Vice-Chancellor and the Dean of Students, was full of praises to the prestigious club for taking a bold step to alleviate the financial conditions of future leaders. He expressed great optimism at the sustained and continued success of the scheme. He also appreciated the blossoming chemistry the club has had with the school management over the decades. Next, there was the awarding of the certificates of scholarship as well as the official conferment of the title *”Sigma Scholars”* to the beneficiaries amidst joy and standing ovation. One of the beneficiaries, Mr. Kikiowo Kingsley, a first-class student of the Faculty of Law, responded on behalf of the Sigma Scholars, assuring that they shall continue to lead the crusade for the change the society needs, and sustain the tradition of academic excellence. He also expressed profound gratitude to the club for finding them worthy of a lifetime opportunity as this. The closing remark was made by Dr. Femi Oyamakin on behalf of all Old Sigmites, while the Sigma Deputy Chief, Loyalist Yusuf Waheed, gave the vote of thanks and led the Sigma Anthem to close the occasion. Selected beneficiaries from various faculties across the University who were present at the presentation of the certificate of Scholarship, held at Alumni Conference Hall, University of Ibadan include; Adedeji Olaide (Linguistics), Adeyemi Victor (Physics), Akinade Wuraola (Electrical and Electronics Engineering), Anyirinonye Chinaza (Medical Laboratory Science), Kikiowu Kingsley (Law), Oghieriahki Favour (English), Okposo Okechukwu (MBBS), Omolaye Janet (Law), Williams Christiana (Law), Ofumwengbe-Evba Esosa (MBBS).